Our next project is going to be using mahogany wood. I've been wanting to age out mahogany for a long time, but only had a few boards of it, and frankly, that is just boring. Instead, we are going to do a guitar body again. This has the advantage of showing you the curves, hard edges, flat surfaces and a more realistic view of what it will do. We are also going to test them in a new rig configuration, using the SG-1-40 lamps but instead of 32w to 40 watts, we will be pushing them at 60 watts each using a pair of Workhorse 8 ballasts (6 wires, 2 per lamps, so 3 lamps per ballast). This is a pretty standard High Output configuration, or HO mode. We are also going to start with a fresh set of lamps, since I am worn out the last set. Took 18 months to do it. 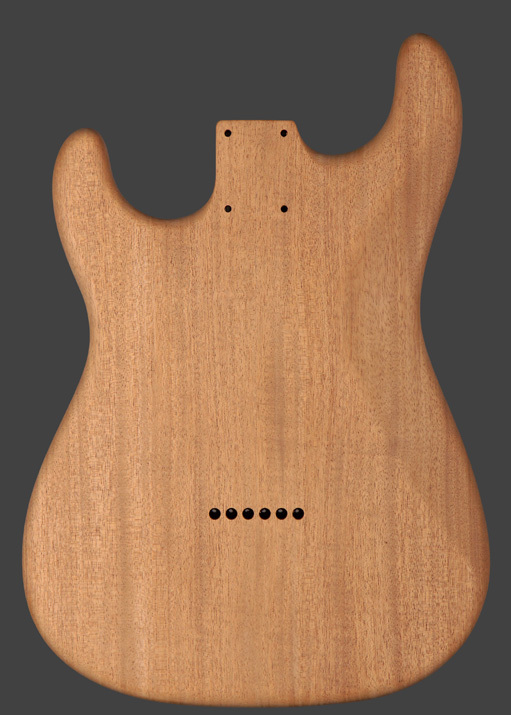 For the guitar body, we are going to take this body from Warmoth and get them to open up the back pickup route to accommodate a humbucker, but other than that, it will be exactly as shown. We will age it exactly as you see it with the goal of getting maximum darkness, and just see what happens. 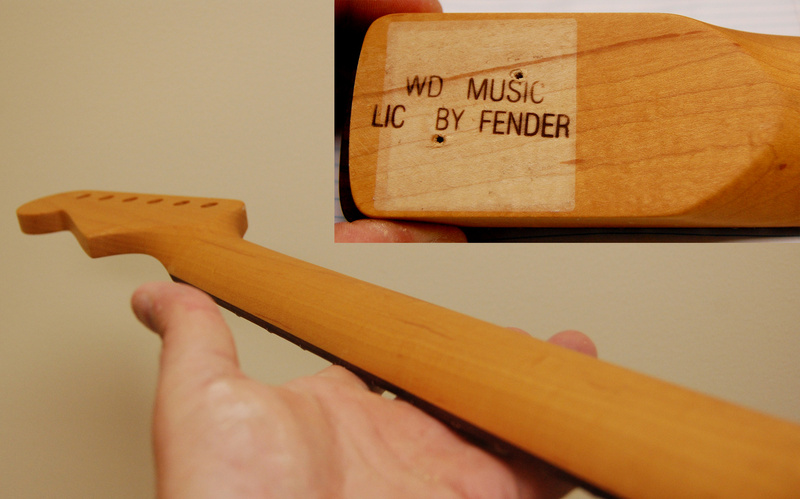 Warmoth is a licenced Fender replacement parts builder, and known to be one of the best, if not the best, for quality. this is a two piece body, bookmatched. This means they saw the thick board in half and lay it over so the grain matches and it looks like one piece. This is a good theory, but doesn't always work out. This guitar, however, matches perfectly and you can't even see the line where the two pieces meet. As I wanted an exceptionally high quality piece of mahogany to work with, I'm pretty happy with my choice. 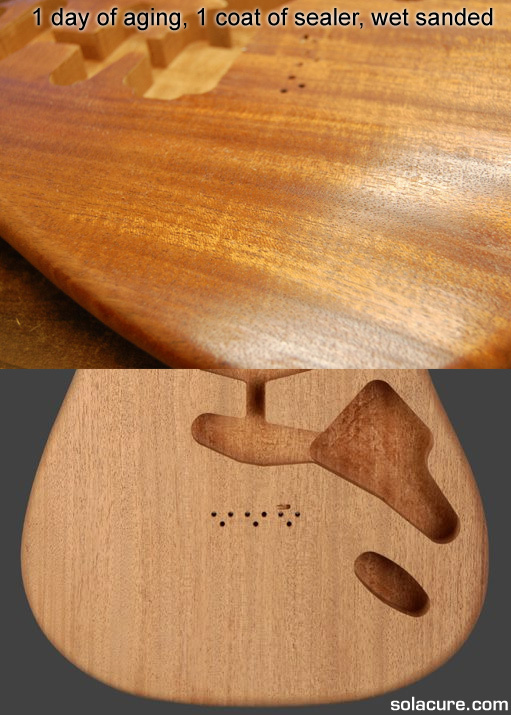 The blank as shown comes in well under 5 pounds in weight, so is lighter than average for mahogany and very manageable for a musical instrument. 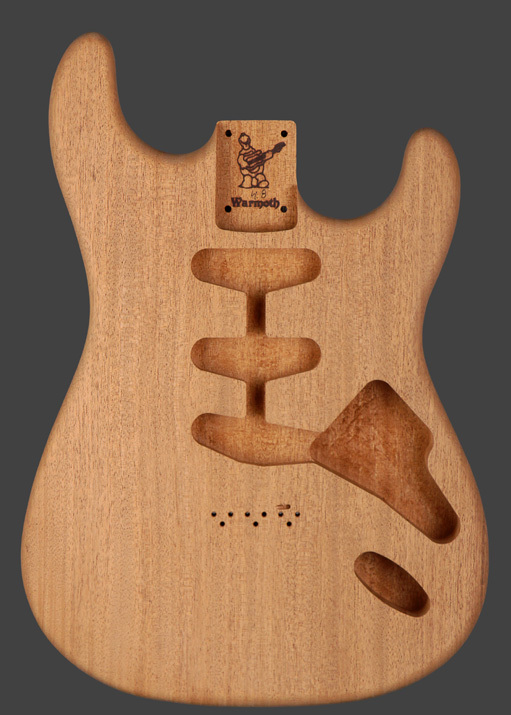 Warmoth "hardtail" Stratocaster body, HSS configuration, 2 piece mahogany. Fender pots, 5x switch, and pickguard. Modified wiring to single tone. All parts are made in the USA except maybe a few screws or misc. Solarez urethane "rock hard" UV cure finish. I sanded it down, wet it to expose the tiny fibers, let it dry, then sanded it again. It wasn't enough. I let it age one day in the main UV light rig, then using a buffing pad to clean it up and put on a medium coat of sealer. The tiny fibers still soaked it up, but that is fine. After curing the seal (Solarez's UV cure sealer), I wet sanded the whole thing and now starting to age it some more. I will likely repeat with a thin layer of sealer and some more wet sanding before starting the finishing process. After just a day of aging, you can see a moderate difference. The finish itself makes it look wet, but the aging make it look more of a caramel color, and more is yet to come. I don't usually buy preloaded pickguards, I build my own out. 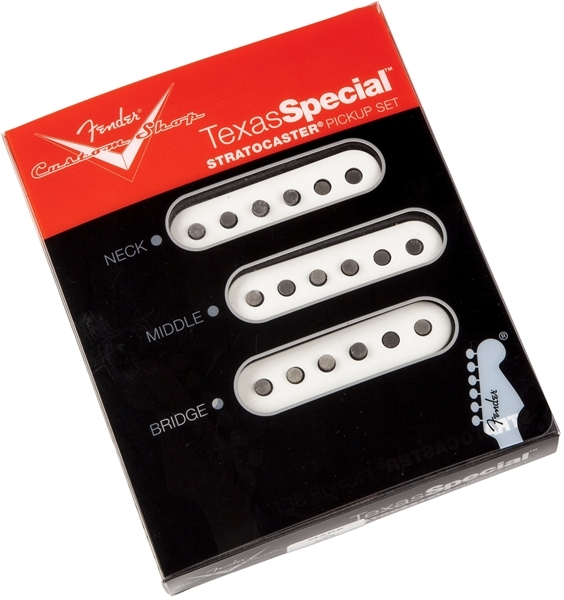 This one has the Texas Specials with Fender black covers that bought, CTS pots and Fender 5x blade. Pretty standard except I leave the first hole empty and use a single volume and single tone only. 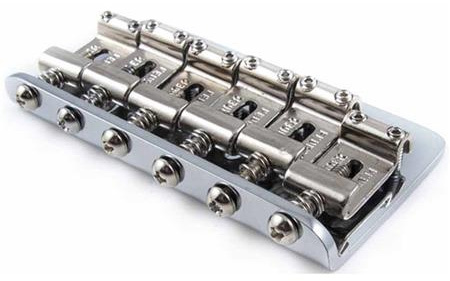 My knuckles tend to smack the volume knob when play, as I play way back on the bridge. This has nothing to do with the wood, of course, but I decided a completely black pickguard system will draw more attention to the wood, which is the goal. 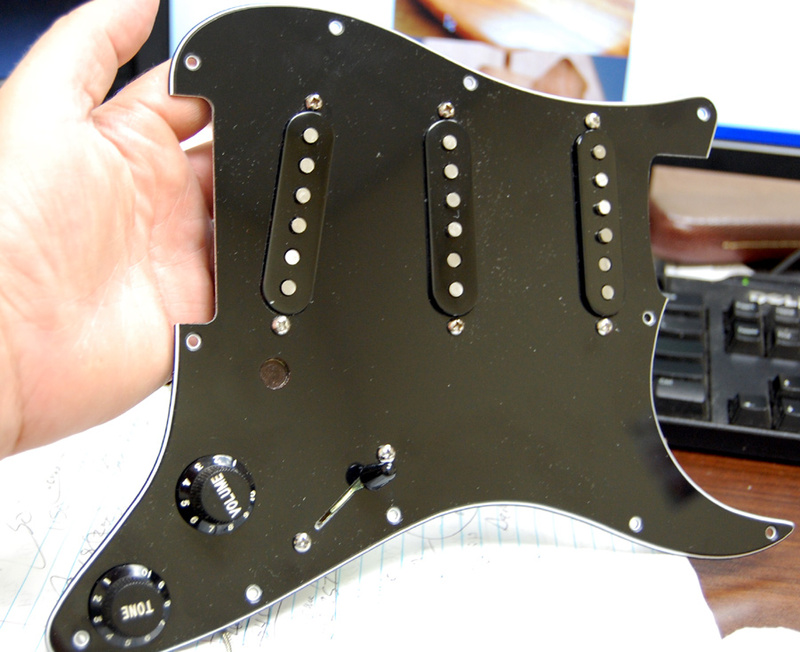 I might even use black screws in the pickguard, something I do regularly. Have the neck about ready. I did some serious aging of the wood, only took a couple of days with this new high powered setup. As usual, I left the label on the neck, so I could peal it off and see the before and after. 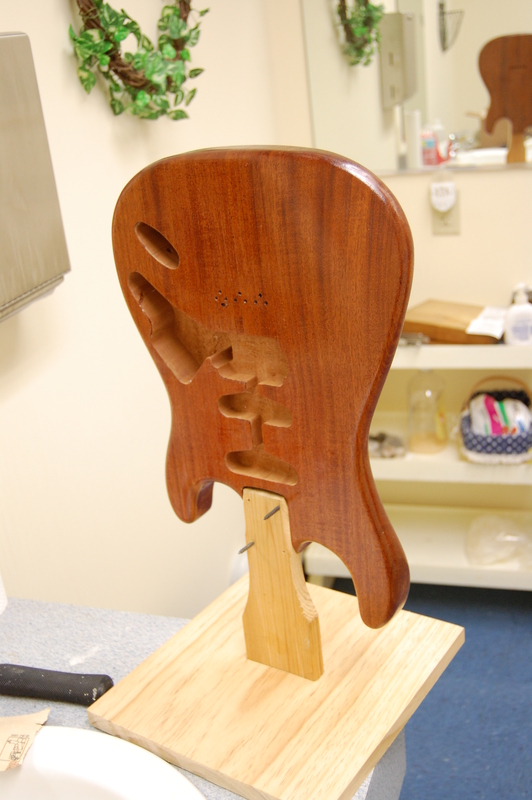 Obviously this did the trick and the neck looks great: A natural aging process is way better than tinted polyester, and lets me run with the factory, ultra-thin urethane finish. Feels almost like bare wood. Built a quick stand for the guitar. This will make putting on the final coat easier, as well as aging it. I still haven't finished my 4 sided rig (I know...) but I should be able to do a good job with the rig I have by turning it on its side. This is after a couple of days of aging in the high powered rig. Definitely makes a difference going from 32 to 60 watts. Sometimes, things go horribly wrong. This is one of those times. 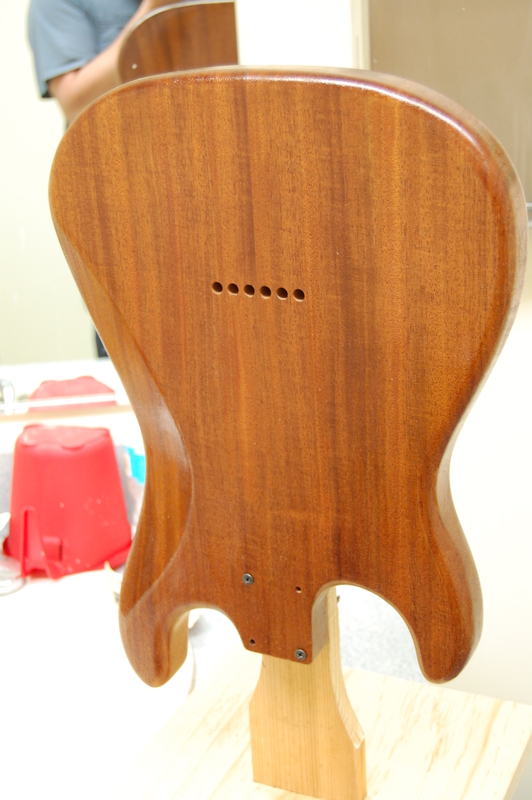 I had put one coat of UV cure resin on the guitar, and then I decided to put a coat of lacquer over the UV resin. Not a good idea. It started to buckle and crack a little. Dang. 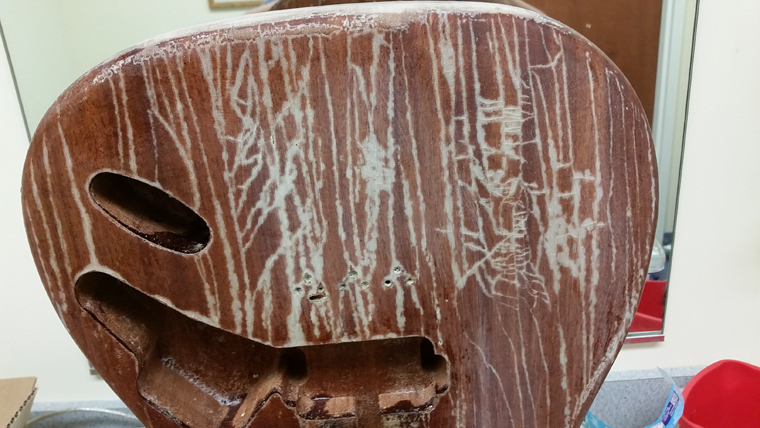 So I tried to remove the nitrocellulose lacquer using lacquer thinner, hoping to salvage the under coat. Not a chance. Instead it went FUBAR and started cracking and crazing, just getting worse with everything I tried. This is where I remind you that I'm an expert on UV, not on finishing guitars. I tried every kind of reducer and stripper known to man. I even tried a heat gun. In short, I've had the reverse Midas touch since touching the lacquer. So now I begin the task of sanding it down, manually, which probably means sanding through the oxidation in some areas, so I will have to re-age the guitar. Once I get it back to raw wood, I'm not worried, but getting it there will take some effort.